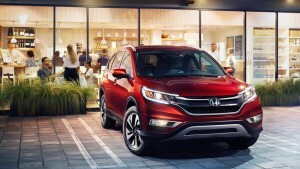 If you are looking for a vehicle that is amazingly reliable, capable and comfortable, then visit Sanford Honda today and test drive the Honda CR-V. We think you will be surprised by this compact SUV from your local Honda dealership that has defined its class for years and accommodates like none of its rivals can. Whether you need a vehicle for the workweek carpool commute or something to keep your active family happily on the go, a 2016 Honda CR-V will provide capability and renowned quality for many years. This smaller SUV with big potential comes in a few different trims to fit different needs and lifestyles. The LX trim of the CR-V offers you the choice of standard two-wheel drive (2WD) or continuously variable all-wheel drive (AWD). From there the LX in either drive type is loaded up with hill start assist, vehicle stability assist with traction control, Eco Assist and a smooth continuously variable transmission (CVT) to provide the driver with a premium experience at a value price point. Additionally, a 2016 Honda CR-V LX is teeming with technology sure to make life on the roads easier. Bluetooth HandsFreeLink and SMS text messaging let the driver focus on the road while passengers rock out to Pandora and Bluetooth compatible audio. A USB audio interface means that just about any smart device holding music can be played through the vehicle’s 160-watt stereo system. Are road trips a regular thing with you? The CR-V Touring trim of the 2016 Honda CR-V is will make driving feel like a dream – even on the longest trip. From stylish features like the 18-inch alloy wheels and clean-looking body-colored side mirrors to technology like lane departure warning, lane keeping assist system, adaptive cruise control, and projector-beam halogen headlights with automatic on/off, this SUV has your back when it comes to being safe as well as looking cool. So what are you waiting for? Visit Sanford Honda in NC today and test drive a 2016 Honda CR-V to experience quality and value like never before.